You are here: Home » MEDIA » Books » The Fantastic Made Visible edited by Matthew Wilhelm Kapell and Ace G. Pilkington (book review). 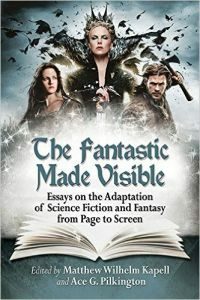 The Fantastic Made Visible edited by Matthew Wilhelm Kapell and Ace G. Pilkington (book review). ‘The Fantastic Made Visible’ has nothing to do with invisible films. The sub-title, ‘Essays On The Adaptation Of Science Fiction And Fantasy From Page To Screen’, is more explicit. As co-editor Ace G. Pilkington explains in the introduction, this book is all about looking at how key original stories were adapted into films with the occasional references to TV versions. Don’t expect this book to be comprehensive in its 14 essays and it could certainly do with a sequel with adaptations they missed. There’s nothing on ‘Narnia’, ‘Alice In Wonderland’, HG Wells’ ‘The Island Of Dr. Moreau, ‘The Invisible Man’ or ‘The Thing’ (John Campbell’s ‘Who Goes There’ not the Fantastic Four character) thinking off the top of my head. At the end of each essay, you can an extended list of films which includes associated films but also the specific adaptations for those discussed. Useful if you want to track down any you might have missed. The bibliography follows similar lines and might offer you some surprises as well. I should point out that all essays have detailed synopsises so if you’ve missed a book or film, you should be able to follow their arguments. Oddly, Jules Verne has one of the highest books turned to film quotas with his ‘Journey To The Centre Of The Earth’ (1959) getting the most adaptations. Robert Heinlein is amongst the first of the SF authors to write the screenplay of his material, in this case, ‘Destination: Moon’ (1950). Shakespeare, if he didn’t write SF, certainly wrote fantasy. Although this book doesn’t focus on the likes of ‘A Midsummer’s Night Dream’ (another play which has had multiple film adaptations), they do examine his plot of ‘The Tempest’ as used in ‘Forbidden Planet’ (1956). We all know that the original ‘Star Trek’ used the film as its template, I never realised the episode ‘Requiem For Methuselah’ and even the later ‘Enterprise’ episode ‘Oasis’ relied on the same plot. There is an interesting comment by Pilkington how could Robbie the Robot have made the steel for the spaceship that implied it came from his own body. Like the whisky, he only digests to find out its composition and makes the final product in the lab, like he did with the star sapphires for Altaira’s dress. The examination of Morbius not being a villain is also true. Imagine what would have happened had he been though. As to the destruction of Altair IV and the removal of Krell knowledge. That would happen with any nuclear reactor – you only have to look at ‘Alien’ to see what happens if you turn off the cooling system – but you certainly wouldn’t want a resurrection of their most dangerous device later. Even Morbius said he’d only examined a few bits of their technology and that was way beyond mankind. At any point in the future, Man simply wasn’t ready for Krell technology. I never realised that in the Brothers Grimm original tale of ‘Snow White’ that the princess was only supposed to be 7 years-old. When you extend this to the prince waking her from the deathly slumber, I agree with essay writer Kate Wolford about some uneasiness about this and no wonder she’d been aged older in all film adaptations. Interestingly, the story gets two essays. The second essay on ‘Snow White’ by Luis Guadaño focuses on the three two years anniversary films but also points out that the Brothers Grimm didn’t even originate the original story but grew it from a real life event. Even the dwarves weren’t something they started with, neither. ‘The Invasion Of The Body Snatchers’ by Jack Finney was a three part story in ‘Collier’s’ before being retweaked into a novel as a possible film property twice between films as essayist Kelley Crowley relates and Finney never had the communists in mind, unlike the first film director Don Siegel saw as an undertone in his adaptation. With four films based on the subject, ‘The Invasion Of The Body Snatchers’ shows it’s the kind of subject that will always last. I mean, a covert alien invasion by people we wouldn’t hardly suspect still goes on today. Just don’t sleep on the subject. It’s hardly surprising that Pierre Boulle’s ‘Monkey Planet’, the source for all the ‘Planet Of The Apes’ films is here. Thinking about it, you do have to wonder what other species role reversal could be done but then no one’s filmed versions of Cordwainer Smith’s ‘Instrumentality Of Mankind’ assorted adapted animals stories nor Daniel Galouye’s ‘Project Barrier’ using sentient bears yet. The ‘Apes’ films represents one of the first SF franchises brought along by accident than deliberation. After all, director Arthur P. Jacobs couldn’t have anticipated how much of a success the first film would be and it was 20th Century Fox that kept asking for more but not increasing budget to match inflation of that time. What is interesting about essayists Dean Conrad and Lynne Magowan’s piece on the first ‘Planet Of The Apes’ film is the examination of Lt. Stewart’s role. Granted she died in the hibernation chamber from an air leak but she was seen more as breeding stock had she lived. One has to wonder why they didn’t have equal numbers of men and women on-board but this was the late 60s and Stewart’s fate was already sealed. I’m surprised that neither essayist speculated on her fate her she survived. Would she have ended up in a museum like Dodge or lobotomised like Langdon? Certainly, it would have changed Taylor’s situation with Nova. Having been brought up in that era, for a lot of SF films, the woman was the token character. Even when she was given the lead, as with ‘Barbarella’ (1968), the rest of the cast was still mostly male. Nothing to do with sexism but more the role in society at that time. Oddly, this book doesn’t stay focused on multi-film adaptations and there are singular films as well. Whether this was for balance or particular essayist’s knowledge or desire to make a point is hard to say. Certainly, Roger Kaufman’s assertion of the Hobbits being gay in ‘Lord Of The Rings’ did raise my eyebrow. Kaufman acknowledges that Tolkien probably didn’t write them with that in mind and I’m just puzzled, no matter what a writer’s sexual orientation is, that they can’t just accept platonic friendships can exist. With Sam calling Frodo ‘Master’ all the time, you could equally give an argument for a Dominant angle. It isn’t there and I tend to think people read far too much into things. If anything, there is an argument as to why there isn’t any gay top sellers and film adaptations but it can’t happen with most of the traditional tales. I was a bit puzzled why ‘Abraham Lincoln: Vampire Hunter’ was included by essayist Nils Bothman because it is too modern in a historical point of view from being written today than the others here. He does extend his piece to super-heroes not killing in the comics but doing so in the films, even by the most stoic of them like Captain America. I had a think about this and think that even unintentionally, if these characters did not get some serious damage or death, youngsters watching these films would get the wrong impression that violence doesn’t hurt. You films being seen by more people than reading comicbooks, it’s best not to give the wrong impression. With ‘The Wizard Of Oz, essayist Annah E. MacKenzie focuses on the 1939 film with touches of the other films. The first film wasn’t actually a success and actually lost money before hooking into TV repeats. Considering the number of books L. Frank Baum wrote 14 about Oz, it’s more amazing that films have been based further down the series. There’s a fair bet that the ‘Harry Potter’ franchise as covered by essayist Cathy Leogrande was put in here for it contemporary success yet, although I never read and only half-watched the first film before boredom crept up on me, the films are supposed to be close adaptations. Hardly surprising when the author is regularly consulted during production and a lesson to all film producers and directors of the value of this when they desire to make accurate adaptations. The last essay by William Hart looks at ‘I, Robot’ (2004) and the latest edition of ‘I Am Legend’ (2008) discussing why there aren’t more black actors in the key lead roles, forgetting that both of these starred Will Smith. Regardless of colour, it is the star that will get more seats in cinema if they have a big enough fan base. With some films, it’s immaterial what colour the stars are. If Susan Calvin has been black then it would have worked against Asimov’s original character whom he described as being rather plain. Although I think this book could have gone further and investigated the differences in adaptations and why, it does give a start on the subject even if it doesn’t cover all the points needed. We all have our images of how a film adaptation of a book should look but irrespective of that a lot of people watch them. The important thing to remember is not to use them as a short-cut to answering questions in an exam because few are that faithful. « The Legend of Tarzan (first trailer).